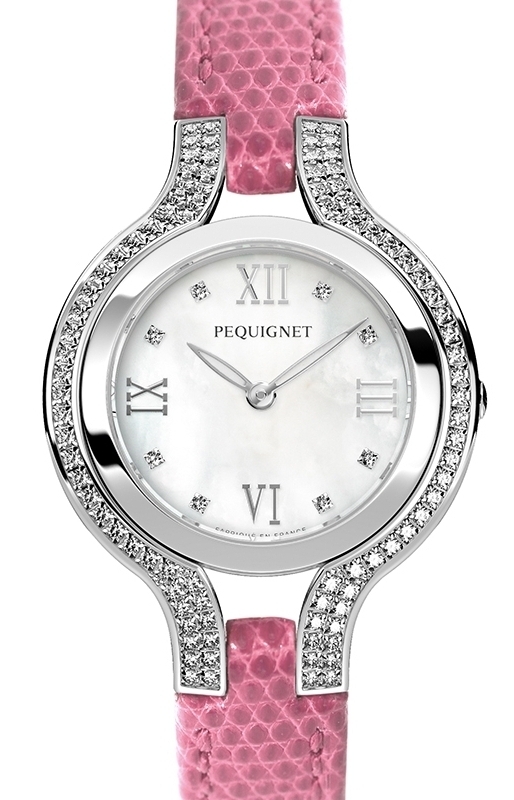 Since its beginnings in 1973, Pequignet has imposed itself as one of the pioneers in women’s watchmaking. Its models have been recognised by many international awards. In particular, the brand was one of the first to offer interchangeable bracelets for its women’s watches. In the image of the Place du Trocadéro opposite the Eiffel Tower, the name of the collection evokes Parisian elegance. The new models in the women’s collection (authentic icons of an entire generation of modern and elegant women throughout the world) are the very incarnation of French luxury. Every watch in the collection, with its smart and sophisticated lines, is a symbol of timelessness. Available in a 32mm diameter case in steel or two-tone steel, these models represent genuine jewellery-making prowess. Available with or without precious stones, they can be worn with steel bracelets, smooth calfskin straps or even genuine lizard skin in a very wide range of colours. “Trocadero Dame”: 316L stainless steel polished satin-finish case Ø 32mm, versions set with 52 to 138 diamonds (from 0.14 to 1 carat), crown with Fleur-de-Lys logo, anti-glare sapphire crystal – Pearl dial with Roman numerals and 8 indices in diamonds – Technical bracelet with patented insertion reinforcing the attachment to the case, in authentic lizard skin and tongue buckle with Fleur-de-Lys logo – Quartz movement – Waterproof to 3 bar (30m).